Taylor Pea Sheller Review The Taylor Pea Sheller, a.k.a. Little Sheller is the only light industrial pea sheller on the market. This bean sheller will last for decades of heavy use. This is probably the largest pea sheller most home gardeners will ever need. Capable of hulling between 3-4 bushels an hour, makes this a ridiculously fast pea shelling machine. It is capable of shelling most kinds of peas and even mature butter beans. For best results and nutrition, it is best to shell, blanch, and can or freeze peas as quickly as possible after being picked. Refrigerating slows down the process of enzymes breaking down the sugars into starch, but the sooner they are preserved, the better. In order to get 100% peak efficiency out of the Taylor Little Pea Sheller, it really is a two man operation. One person standing on each side the machine will still be hard pressed to keep up with the performance of this sheller. Unshelled pea pods just need to be pushed forward toward the rollers. Once in contact with the rollers they will be pulled through and the pods will be opened allowing the peas to pop free. With the large bin it is easy for pea pods to stack on top of each other as they are pushed toward the rollers, it is important to keep the pods flat on the bottom of the tray and ensure the pods are not hitting the rollers one on top of the other. The finger guard helps to prevent this. The finger guard can be adjusted higher to allow thicker peas under it. A simple rolling motion over the top of the unshelled pea pods as you push the peas to the rollers will level them out in to a single row. The shield that is in place should help to prevent stacking but it is always a good idea to make sure yourself. Peas will be deposited in to a 10 qt plastic pan that comes with the pea shelling machine (or a pan that you provide) and the pods will be ejected out the front of the machine. I had a conversation with one gentleman who had inherited his father's farm. They had used a Taylor Little Pea Sheller since the 1970s. He was getting ready to buy a second one and I was impressed by how long the first one had lasted. Suddenly he corrected me, he was not replacing the machine that was still running after 30 years. Oh no! He was buying a second machine to increase production from a new plot of land. He told me, that his machine had sat on the same table, in the same building, being loaded season after season, for 30 years, and it still worked as well as it did the first day he remembered working on it. Talk about a satisfied customer! Taylor Little Pea Sheller is made of sturdy aluminum and weighs 35 pounds including the motor. It is a fairly large machine being 14 inches high and 27 and a half inches long, the Little Pea Sheller will take up a good bit of room in any work area. An eight foot, three-pronged, electrical cord should allow you to easily find an electrical outlet to plug in to. The electrical safety for the motor is impressive, and it is still able to run on a 110 watt power source. This machine is truly built to last for generations, not just for years. One question I always get is about two aluminum plates that come with the machine. When I first found them I thought they might be used to push peas toward the rollers. Then I noticed how neatly they hang on the side of the machine. After digging around I discovered these two aluminum plates are actually splash guards (pea guides). 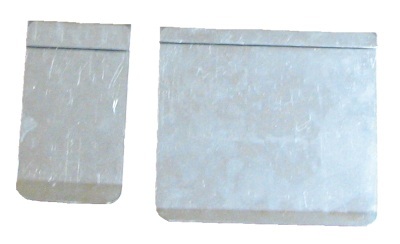 The smaller guard hangs on the same side as the belt guard, over the caution label, and the larger one on the exposed side. These only need to be used if you find out that your peas are bouncing out of the pan, when you first start shelling, beneath the pea sheller and on to the floor. Otherwise they can be simply laid aside. The hopper leading to the rollers is flat. One advantage to the flat bed over the slant is that you can put nearly 1/3 of a bushel in the hopper, instead of having to do it by the handful. It is very easy to get in to the motion of reaching back and pulling pea-pods forward and in to the rollers. The manufactures of the Little Pea Sheller have put a lifetime (actually two lifetimes) of thought in to safety. One of the most prominent safety measures they have is found when the roller guards are not attached. On a huge label in clear sight are two yellow and red warning labels that read "If you can read this your guard is not installed." I will talk more about the motor later, but there are some important safety notes to be made here. The only problem I see with the Taylor Little Pea Sheller is that it is designed with two in mind. To reach the Little Pea Sheller's potential it takes two operating the machine. 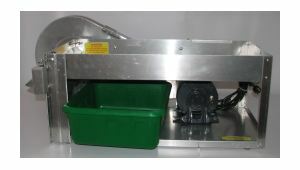 One person cannot reach this machine's potential and it is better to go with the smaller Electric Mr. Pea Sheller. One major problem we highlight in the other pea sheller reviews is the number of mashed peas. This is significantly less of a problem with a creative design from Taylor. The "rolling motion" of the Little Pea Sheller has eliminated the majority of mashed peas we see from other major pea shellers. This is a completely unique feature to the Taylor Little Pea Sheller and truly makes this machine an industry leader. What causes this unique "rolling motion" is a mystery to us, but is definitely an advantage. The Neoprene rollers have a spiraled ridge around them. This spiral helps move anything that might be caught in the rollers to the side and away from the work area. This is helpful if you have a pea-pod with a large bur, as it might not fit through the height setting of your rollers. It is always wise to remove any foreign objects from the pea-pods before pushing them forward. You can simply remove these objects that get caught when you clean the rollers off. It is important to clean off the rollers when things look messy, this can be anywhere from 15 minutes of operation to an hour depending on the type of pea or bean you are shelling. To clean the rollers simply turn the machine off and remove the two roller guards. Take a dry piece of paper towel or rag and wipe both sides of the rollers. Most of what you are wiping away is the pith from the pea-pods, not mashed peas. The pith is the nutrient path for the peas inside the pod, generally the more pith the healthier the peas are. REMEMBER if you adjust the rollers be sure to tighten them back up after you are done. If they are not tightened back it can cause stress between the rollers and the body, creating a larger gap, or even popping the rivets that hold the rollers to the base, detaching the rollers from the machine. Across the top of the rollers are 4 screws. Two that hold on the front guard, and two that are not screwed in all the way. These two that are not holding on the guard are the two that are used to adjust the rollers. Simply loosen them slightly. Then in the front of the machine, on either side of the rollers are wing nuts. Loosen those wing nuts and your rollers will adjust. You will be able to adjust the rollers by hand and can re-tighten the wing nuts and screws. If you create too much of a gap for the pea-pods, they will not open and all you will get is mashed and unopened pea pods. The Little Pea Sheller is powered by a 1/3 horsepower Dayton electric motor. The motor does have an on/off toggle so it can remain plugged in. This motor is three times stronger than the Electric Mr. Pea Sheller. 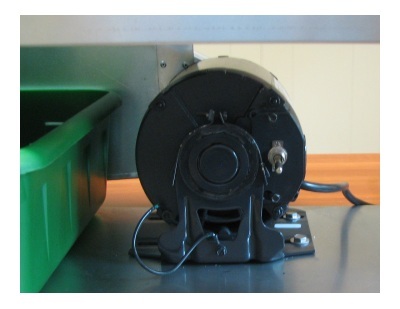 While the motor is exposed on the Taylor Little Pea Sheller the belt has a guard that needs to be attached. The belt guard does a satisfactory job of protecting the belt and keeping anyone, or any article of clothing, from getting snagged. I do not consider the exposed motor a problem, just be aware not to come in contact with it after the machine has been running for awhile as it does get warm. This guard needs to be installed when you first open the Taylor Pea Sheller box. Attaching the belt and guard can take between 25 minutes and an hour and half depending on your mechanical skill, but everyone should be able to attach it. One more note on the motor, it is not meant to be immersed in water. Even washing the bottom of the machine off with a water hose is not recommended. If you absolutely must clean the bottom of the machine, I recommend a wet wash cloth. And simply wipe the motor off with a dry cloth or paper towel.